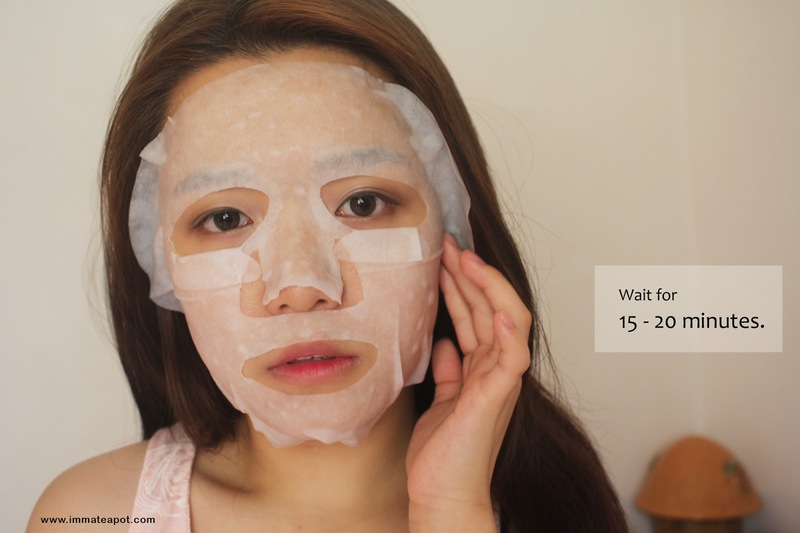 If you have been a big fans of my blog, you may keep track with my skin condition comparing the very first bared face posting till now. Before that, my skin was dry and sensitive. I have really large pores and there was red blemishes all over my face. It was partially due to my 'falseful' makeup removing routine, being harsh to my skin and did not apply the proper double cleansing. I used to have flammable feeling whenever I apply mask, instantly I threw the mask away. Can you imagine how badly my skin condition was? Until I found the ultimate secret from Fan Bing Bing, of keeping a habit of applying mask daily. Since then, I am super obsessed with the mask routine and I can use like one piece per day, sometimes twice per day. Recall back my Taiwan Trip, I have brought back like 10 boxes of mask? LOL. It's really important for me to discover all kind of masks that suits my skin yet providing all types of nourishment, as in hydration, lifting, pores-reduction and etc. Of course, seeing the instantaneous result on my skin. 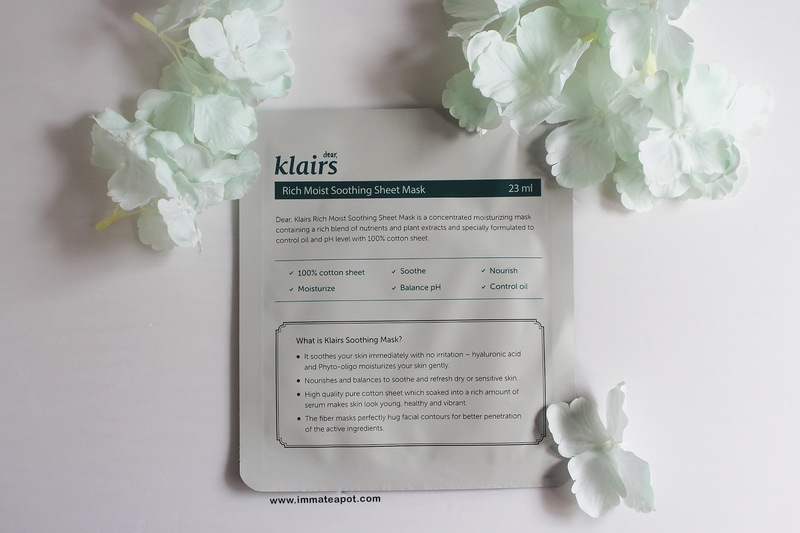 Recently, I have been trying the Klairs Rich Moist Soothing Sheet Mask. Klairs is a brand originated from Seoul, South Korea, carrying a mission of solving skincare problems for those with sensitive skin. 'The skin need sufficient moisture and soothing' - Klairs. That was why rich moist soothing sheet mask created for. 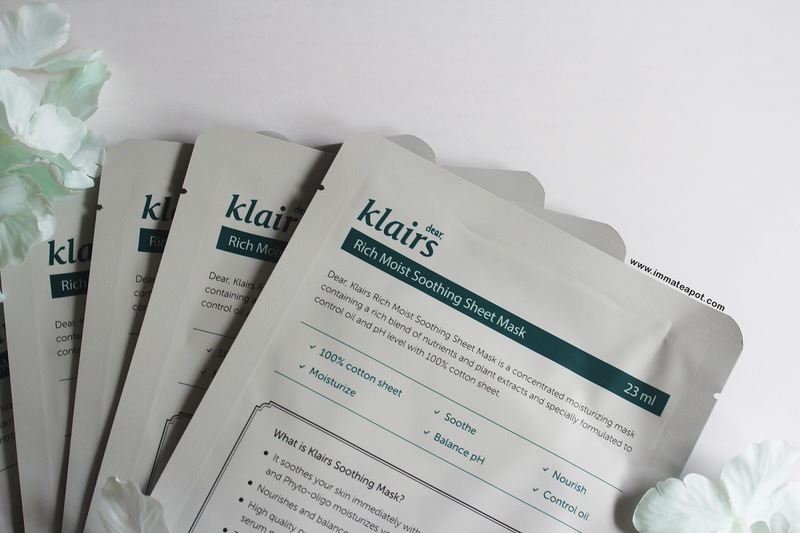 Klairs Rich Moist Soothing Sheet Mask is a concentrated moisturizing mask that contains rich nutrients and natural plant extract. It is formulated to moisture the skin while maintaing the skin pH level and control sebum. Hollyhock's root extract, Phyto Oligo extract, Wheat amino acid, Luffa Cylindrica leaf and fruit extract, Althaea Rosea Flower extract, Brassica Oleracea Italica (Broccoli) extract and some other plants extract. The mask is in 100% cotton material, ensuring the perfect grip on skin and maximum absorption. I was glad that it wasn't too thick, like the usual one. The essence was dripping when I was picking the mask out from the packet, it is thick and concentrated! There is a mild scent from the mask, some sweet refreshing fruitilicious aroma. Before applying the mask, my skin looked rather dull and dry. It wasn't glowing in health or radiant LOL. The texture was rather rough with the appearance of pores, especially at the forehead, chin and side of the nose area. Excuse my panda eyes. I wasn't getting a good sleep the day before. The application of Klairs' mask is same as the usual. Step 1: Make sure the face is fully cleansed before application. Step 2: Fit the mask over the face while patting on some remaining essence on the packet on to the mask. Step 3: Wait for 15 minutes. Remember not to overtime, as it may work reversely. The dried mask may absorb back the moisture from our skin layer. Step 4: Remove the mask after 15 minutes and gently massage your face with finger tips until the essence is fully penetrated into the skin layer. Massage your neck as well with the remaining essence on hand. Tadaaa! It's done! 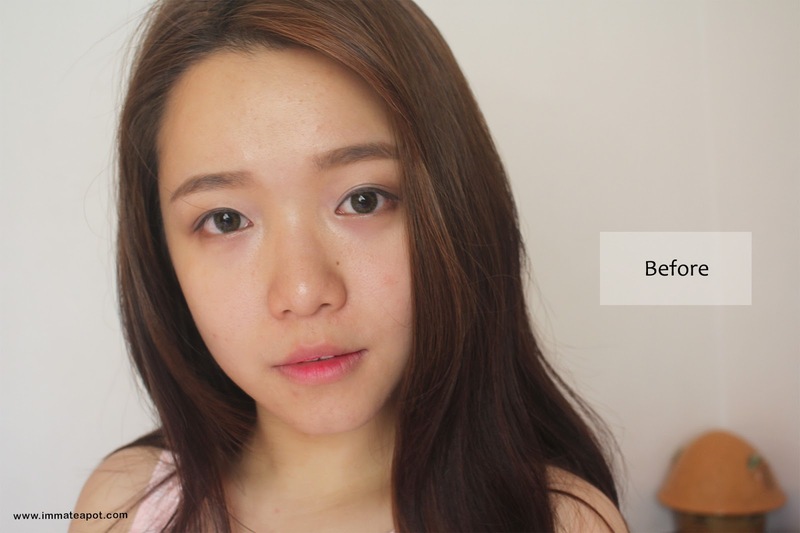 There was significant result on my skin, instant glow and dewy skin! My skin was so soft and smooth after the application. Besides, I felt the suppleness within my skin, much bouncy and hydrated! I loved how amazingly the mask stayed still on my skin even I was walking around. After the application, I felt my skin was so calm, soft and elastic! There wasn't any greasiness leaving behind and it penetrated into the skin really fast. I have to oppose its claims of no stickiness as I guess none of the skincare products leave with complete zero stickiness, else we will feel like applying nothing on the skin LOL. But it wass! Less sticky as time passed! I am now enjoying the pampering session with my mom! 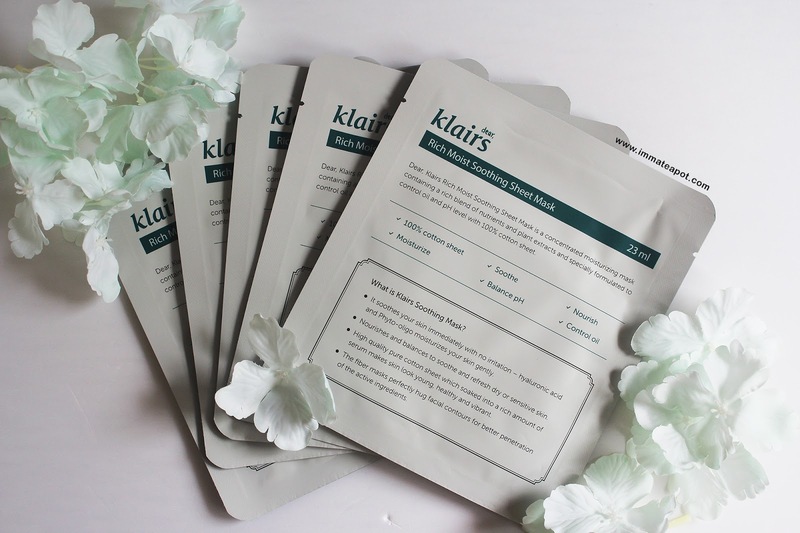 Instead of RM119, Natta Cosme is having a promotion for Klairs Mask at only RM69! Grab it before it's too late! Love how it makes ur skin look so dewy and fresh!!! Gosh! your face look fresh. I love Klairs too. You look great and nothing like how you described your skin condition last time. I too love masks, but I have trouble remembering to use them! You always have the glowy and moisture skin =D Love it! I am currently using this mask too!